After leaving Yosemite, we stayed a night in Hollister. There's not a lot to see in Hollister, but it was a good night stop and next day we drove on to Monterey. The reason we stayed in Hollister was because Montererey was full with attendees of the "Concourse d'Elegance" - one of the biggest car shows in the country. Our first stop was Fisherman's Wharf which was empty and a little cold. We also drove through Cannery Row (of Steinbeck fame) but didn't stop to shop. Then on to Carmel. Although the Concours was in Monterey, there were lots of exotic cars around and the sun was shining. We stopped at the Big Sur Bakery and Restaurant, but the restaurant was closed, so we had to settle for coffee and a pastry (or trifle, in my case). The Big Sur Bakery and Restaurant. Apparently, it has quite a reputation, but we had to settle for coffee! We stopped to admire a colony of Elephant Seals, which were impressive for their size and the males for their aggression towards each other. Finally, we arrived at San Simeon in time to watch the sun set over the Pacific Ocean. We started the day by visiting "Hearst Castle" which was just a mile or two back up the road. It was built by WR (William Randolph) Hearst starting in the 1920's and continued being enlarged until his death in 1951. We took a quick guided tour of the main public rooms and then were left to wander around the grounds. We spent the night in Santa Barbara at the Mason Beach Inn, which was a couple of blocks from the waterfront. We ate dinner at a waterfront restaurant and next morning, went to explore the shops. As they didn't open until 10:00am, we first went to see The Mission of Santa Barbara. Founded in 1786, it has been an active mission ever since, although the main building has been expanded and rebuilt several times. Skull and crossbones over the doorway leading to the graveyard. Then back into Santa Barbara, for shopping. Then finally on to Venice Beach and Hollywood! We stayed in a rental home about three blocks from the ocean. While we were staying in LA, we spent some time together and some time seperately. Sarah and Jenny went to Universal Studios. On another day, Kris and I visited the Nixon Presidential Library, in Yorba Linda,about an hour from downtown LA. A memo wriiten for Nixon (but not seen by him at the time) to be used if Armstrong and Aldrin became stranded on the moon. I guess they didn't have a lot of faith in the ascent engine of the LEM. Statues of men Nixon knew who he onsidered to be statesmen. Churchill, DeGaulle and Adenauer are on the right. The house where Nixon was born, on it's original site. The helicopter he used as President. It was used by Ford and then retired. 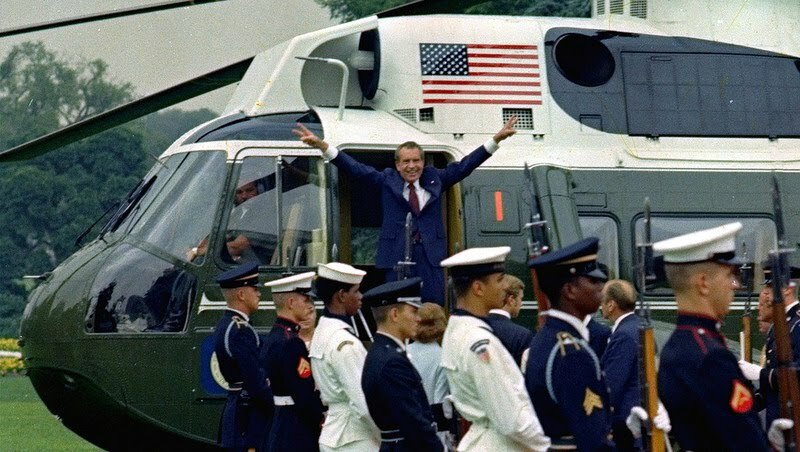 This is the famous photo of Nixon leaving the White House after resigning. Same helicopter! We visited the Venice Canal Historic District, a small neighbourhood built in 1905 where all the homes face onto canals. At one time, the canals occupied an area three to four times the size of the remaining area. Those canals were filled in to make roads. Kris and I took a "VIP" tour of The Warner Bros studios - a real working film studio. The "Town Hall" and square were about to be used as "Rosewood" in the TV series "Pretty Little Liars" The teenage girls on the tour knew what this was all about and were VERY excited. The actual couch and set from "Central Perk" on "Friends". A paralyzed Hermione from "Harry Potter"
The fireplace from Harry's first home. The letters are all invitations to join Hogwarts. And partly to get a photograph of the Hollywood sign! "Sergeant Peppers Lonley Hearts Club Band"
On our last day, we went to visit Rodeo Drive. All we could afford was a cup of coffee or a glass of juice each in a rather ritzy cafe. And that was the end of LA. After dinner at Venice Beach in the evening, we said our farewells. The next day, we took Sarah and Jenny to LAX for their flight home and packed up the house before leaving the city. But we still had one last place to visit. After seeing Sarah and Jenny off, we took the ferry over to Catalina Island. And finally, we leave Catalina behind in a shower of spray. So back to LA and next day, on a plane to Orlando - the end of a road trip covering 52 days and 8,500 miles of driving.